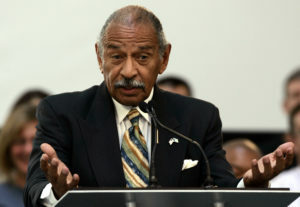 DETROIT — Longtime Michigan Rep. John Conyers on Tuesday denied settling a complaint in 2015 from a woman who alleged she was fired from his Washington staff because she rejected his sexual advances. The website BuzzFeed News reported on Monday that the office of Conyers, 88, paid the woman over $27,000 to settle the complaint under a confidentiality agreement. Conyers, who answered the door at his Detroit home, told The Associated Press that he knows nothing about any claims of inappropriate touching and learned of the story from television just hours earlier. “I have been looking at these things in amazement,” he said, referring to allegations of sexual harassment and assault being made against politicians and others. House Speaker Paul Ryan labeled the report “extremely troubling.” Ryan, R-Wis., said the House is updating its policies for handling complaints of workplace harassment and discrimination, which have been criticized as too weak and cumbersome. His statement did not name Conyers, but Ryan spokeswoman AshLee Strong confirmed it was directed at him. Les Alderman, a Washington attorney who has represented victims in several workplace discrimination lawsuits on Capitol Hill, including a sexual harassment case against Rep. Blake Farenthold, R-Texas, said it’s virtually impossible that Conyers wouldn’t be aware of a settlement after a complaint was brought to the Office of Compliance , which oversees dispute resolution involving legislative branch employees, among other things. Alderman said such complaints can conceivably be settled outside official, institutional channels. But if a claim is brought to the compliance office, the lawmaker would be aware of the complaint, as well as any settlement made in the case. The government has paid more than $17 million in taxpayer money over the last 20 years to resolve claims of sexual harassment, overtime pay disputes and other workplace violations filed by employees of Congress. The Office of Compliance released the numbers amid a wave of revelations of sexual misconduct in the worlds of entertainment, business and politics that made its way to Capitol Hill last week. Two female lawmakers described incidents of sexual harassment, one in explicit detail, and Minnesota Sen. Al Franken apologized to a woman who said he forcibly kissed her and groped her during a 2006 USO tour. AP reporter Juliet Linderman in Washington, D.C., contributed to this report.